I’m back from a 4-day trip to Varese and a 4-day enforced internet silence. Yes, we took my beloved’s laptop. Yes, we had WiFi on tap. My beloved forgot to take his charger. Yes, we bought a spare charger in MediaMarkt. No, it didn’t work, but the instructions said they’d sent us the correct Dell connector if we identified it on line. We didn’t bother. It did of course mean that my beloved had a real break from work (no bad thing) and was able to answer the most pressing emails and calls via his Blackberry. The purpose of our trip was 2-fold: check out our Swiss friend’s new bike shop and afore-mentioned break. We stayed in the same B&B I stayed in for the 2008 World Championships’s in Varese. Indeed, we’re now quite regular visitors and the owners (and their cats) treat us like family. They’re very busy with their flower shop over Easter, so generally don’t accept guests during this period. We therefore had the run of the place which feels pretty much like home. Our friend has opened his shop on a busy stretch of road between Lugano and Mendrisio along which absolutely every cyclist in the area travels. In the three weeks that he’s been open, he’s been exceedingly busy and has sold a complete bike and a set of carbon wheels each week, along with assorted repairs and sundries. More importantly, he’s enjoying himself. I’m sure he’s going to make a success of it. The riding around Varese is different to the Core d’Azur: not better, just more undulating. 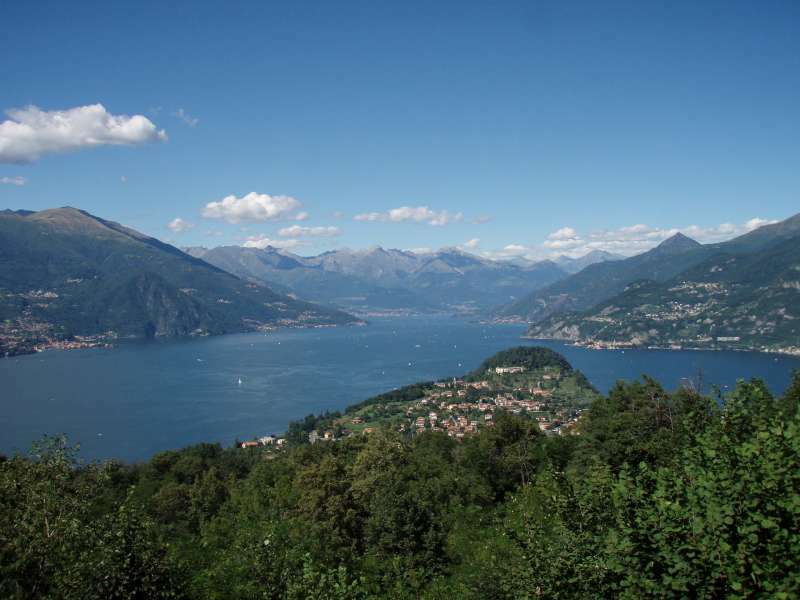 On Tuesday, we rode along the lake from Como to Bellagio, up the Ghisallo and back. The route is constantly up and down and therefore it’s difficult to establish any kind of rhythm. Despite it being the run up to Easter, there was little traffic and the roads were peaceful. The weather was gorgeous. Warm enough to encourage me to wear my bib-shorts for the first time this year. The climb up to Ghisallo is brutal, it hits over 18% at one point. My cadence was so low, the legs were barely turning. The view was however worth it. Wednesday, we opted for a gentler ride around the eastern side of Lake Maggiore which, while still undulating, is much kinder on the legs. Again, there was little traffic. We returned to base after lunch to watch La Fleche Wallone. La Gazzeta dello Sport favoured a Spanish win largely on account of the finish being on the brutal Mur de Huy. 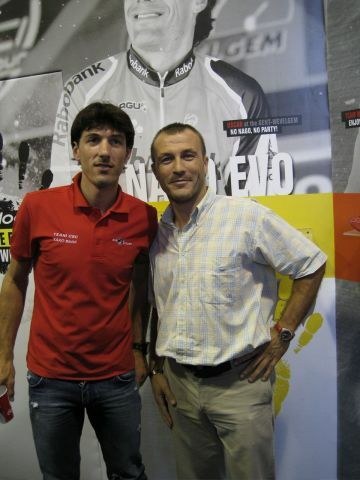 They speculated that this would suit either Contador (SaxoBank Sungard) or Joaquim Rodriguez (Katusha). But mostly, they bemoaned the lack of an Italian challenge. The Italians were enjoying better luck in the Giro del Trentino which had started with a 13.4km time trail around Lake Garda the day before. This had been won by Andreas Kloeden (RadioShack), his 4th win of the season. He was a second ahead of Andrea Malori (Lampre-ISD) and a couple ahead of team mate Tiago Machado. Another man in fine early-season form, Thomas Voeckler (Europcar), had taken Wednesday’s 184km stage ahead of Michele Scarponi (Lampre-ISD) to record his 6th win of the season. The Italian moved into the lead on GC where he remains going into today’s final stage. Yesterday’s queen stage, which finished atop the cat 1 climb of Fai della Paganella, was won by the latest Columbian climbing sensation, Fabio Duarte (Geox-TMC), former 2008 Varese U23 world champion. Meanwhile, back in Belgium, the peloton had reeled back in the early escapees and was steeling itself for the final ascent of the Mur. The favourites were pretty much all in contention but who would prove to have the best legs? It was Phil Gil, again. With 300 metres to go, he powered off the front of the peloton leaving himself ample time to celebrate, as he crossed the line ahead of Roaquim Rodriguez (Katusha) and Sammy Sanchez (Euskaltel-Euskadi), his third win in a week and his first in this particular classic. So, there you have it, two of my favourite smiles atop the podium. Who’s going to have the will to beat him this Sunday? I was feeling in particularly fine fettle this morning as I set off to meet my trainer (no laughing please) for our first ride together in the great outdoors. He very kindly rode in front of me while we were riding into a headwind. Laughable really as, while he’s tall, he’s easily half my width and with a single digit BMI. So, not much protection from the wind at all, but I appreciated the gesture. He too must have realised it was futile as we quickly switched to doing relays. Today’s ride included some sprint intervals where sadly I was able to amply demonstrate my lack of explosivity. Still, I persevered. My trainer politely enquired whether my legs were aching. No, not a bit. 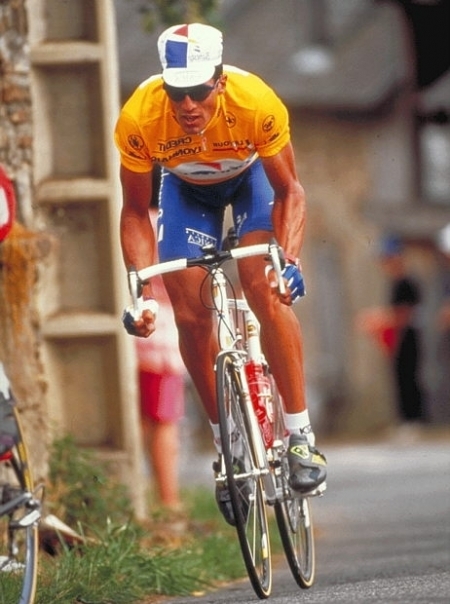 Like Lance, I don’t readily build up lactic acid. In fact, I suspect I use it as a source of energy rather like other people use their fat stores. On the subject of fat, I’m happy to report that last week’s tummy troubles have melted off a couple of kilos. Of course, this could account for why I’ve been feeling so spritely or maybe it’s just the return of Spring. 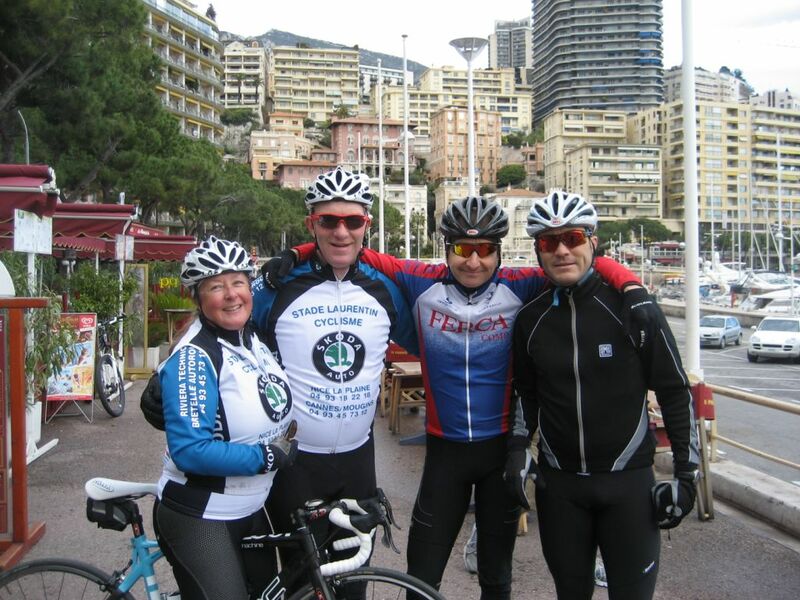 After the training, I rode into Cannes to meet up with an old friend who was at MIPIM, the annual property fest. The place was buzzing. So clearly the property market is picking up, though it’s still a long way off from the heady early noughties. I first met my friend when he bid to act for my previous employer in a professional category on a major property project. Only two firms answered all the questions in our brief and the decision as to which one to pick was delegated to me by the rest of the team. I sought advice from a colleague with more experience in these matters. She gave me some wise counsel. “You’re going to be working closely with these guys for a number of years so pick the one you like the best”. So I did. It’s a decision, I’ve never regretted. I’m now making plans for Saturday and Milan-San Remo. I had such a blast last year, I’ve simply got to go again this year. I’m hoping to meet up with a girlfriend whom I first met when we were both volunteers in Varese 2008. However, rather than go alone, I’m going with one of my girlfriends. We’ll be able to catch up with all our respective news, over a cup of excellent Italian coffee (the best) while we await the start of the live transmission. 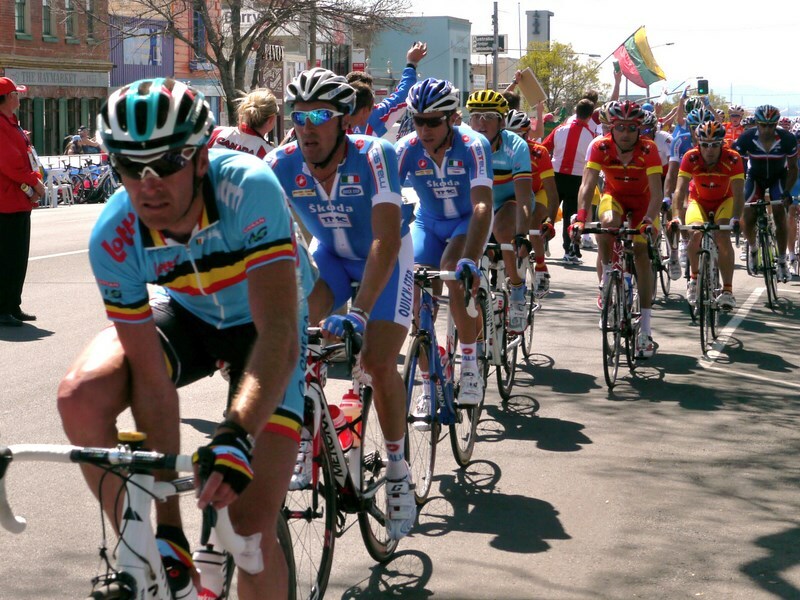 I’m hoping that Boonen’s first win on Italian soil (last week in Tirreno Adriatico) may presage his second on Saturday. We’ll just have to wait and see. My guests have departed after a very enjoyable few days. The boys arrived Thursday evening in time for a light dinner. It was very windy that evening and I had hoped it might blow away the rain clouds. But no, we awoke to torrential rain. After a hearty breakfast we went to one of the larger bike shops for a browse and then collected my beloved from the airport. After lunch, the weather cleared, the sun came up and started drying the roads. We walked down to my LBS for a browse and a chat, returning in time for me to prepare dinner. Saturday dawned bright and warm so we set off around 10:00am and headed towards Monte Carlo where we stopped for coffee and the boys admired the local attractions (all female). We decided to return via La Turbie which afforded them plenty of photo opportunities while waiting for me to catch up. Thereafter, it was a swift descent past Eze village to Nice and home. After lunch the boys had a wee cat nap and then fortified themselves with some of my fruit cake. Saturday evening we dined at a local restaurant which has recently changed hands. We were delighted to find that the cuisine had further improved and the new owners were resting neither on their laurels nor on the reputation of the previous owner. Today’s pointage was at Valbonne and it took me longer to warm up this morning so that I was soon distanced by the rest of my clubmates on the climb out of Biot. Resigned to riding on my own, I was shortly joined by a rag bag of riders from other clubs and merrily rode with them. They expressed horror on arriving in Valbonne to discover an Antiques Fair on the spot where the pointage is normally held. I was able to direct them to the correct location on the other side of the village. I arrived just after my club had departed the pointage so I rode back, as is my wont, with riders from another club, cutting a good 20km off the proposed route so that I could return home in time to prepare lunch for the ravening hordes, all three of them. The boys departed after lunch while my beloved went to meet a business contact in Nice. I rewarded myself with a lazy afternoon on the sofa in my fleecy track suit (what else) catching up on the sports news. Both my football teams recorded draws: Spurs 0-0 AVFC and OGCN 1 – 1 Lille. AVFC take a point from one of their closest rivals for 4th place, while OGCN steadies the ship. First up, my heart was gladdened by the number of wins recorded by the more mature members of the peloton: Rocket Robbie (Katusha) in the Trofeo Palma de Mallorca, Nico Eeckhout (An-Post Sean Kelly) on the final stage of Etoile de Besseges and Ale-jet in GP Costa degli Etruschi. Sky romped home 8 seconds ahead of the rest in the TTT at the Tour of Qatar putting Edvald Boassen Hagan in the leader’s jersey where he’s going to be difficult to dislodge. Quick Step’s Tom Boonen is 20 seconds down after his team finished 5th. Cervelo initially finished second but were penalized when an eagle eyed Chinese judge saw Barbie Barbie Haussler push a colleague. Cervelo claimed he was just steadying him, but the commissars remained unconvinced. On a more sombre note, I was saddened to read of the untimely death of the maestro of the Italian road racing team whom I was fortunate to meet in Varese. My condolences go to Franco Ballerini’s family and friends. I think three world championships and one Tour de France allows me to label myself a serial volunteer. The attraction for me is not the proximity to yards of Lycra, more my fascination with the organization of major events. Naturally enough, I’m most interested in what works really well, what doesn’t and why. Here’s my take on a few things. This year, in order to gain access to the start/finish area, spectators had to purchase a pin. This also entitled you to free travel on the local trains and buses. An inspired decision as it sped up the mass movement of spectators. Unfortunately, having encouraged the use of public transport, they then failed to lay on any additional trains and buses – much less good. The catering facilities in the start/finish and exhibition area could only be described as woeful and an encouragement to bring your own. This may have been why many nationalities chose to hang out at bars in the town. The Dutch, for example, took over a bar on the Acqua Fresca climb while many of the French, Belgians and Italians set up camp around their mobile homes. Missed opportunities, I feel, for local businesses. Shipping in a load of schoolchildren to fill the stands and provide a wall of sound was a great idea but why so few and why only on Thursday? It would have been much better to fill the tribunes, particularly on Wednesday, Thursday and Saturday with OAPs and schoolchildren, rather than leave them empty. Indeed, Swiss TV (RSI) had real problems avoiding shooting the empty tribunes, where there were even seats going spare on Sunday. I was faced with a similar dilemma in Salzburg where I was on guard duty barring entry (to all bar VIPs) to the VIP Tribune for the Men’s TT. Realising this was not going to look good on the big screen, I surreptitiously shipped in a bus load of elderly tourists who were thrilled to have a grandstand seat. They obligingly made plenty of noise each time a competitor came past. The Swiss army had been heavily deployed but, since most were not local, had no real idea of where things were situated and many spoke only Swiss-German. It might have been an idea to provide them with detailed maps, a more thorough briefing and put the more linguistically gifted in key areas. Many of the shop windows in Lugano and Mendrisio had a cycling theme, but not all. This was much better executed last year in Varese where the town totally embraced the championships. But then the Italians are more passionate than the Swiss about most things. Everything was spread over too wide an area. Accreditation was based at a hotel in Mendrisio well away from the race circuit. The UCI were billeted in Lugano and used the University there for their Congress and other meetings. The start/finish and exhibition area, just outside of Mendrisio, was open air, set up on agricultural land with no nearby facilities and a good 20 minute (my pace) walk from the train station. There was no sign of the promised shuttle buses although I did see one or two VIPS clambering inelegantly in and out of army jeeps. I learned that the Organising Committee had decided not to accept volunteers from outside the region on ecological grounds. Indeed, roles were allocated to volunteers based on where they lived: not on prior experience, linguistic ability or any other rational reason. Many of the volunteers (both Swiss and Italian) had worked at Varese 2008 and they concluded that last year’s Championships had been both better organised and more enjoyable. The cinematography of the race was very disappointing. Far too many overhead shots from afar so no one, including the broadcasters, had any idea what was happening at key points in the race. RSI had plenty of time to prepare for this event. Could they not have learnt from the masters of this, the French? Ticino is a beautiful area with lakes, mountains and charming small towns and villages but all the viewers saw was the roads and industrial estate around Mendrisio. Do you not want to boost tourism in the area? Obviously, not. 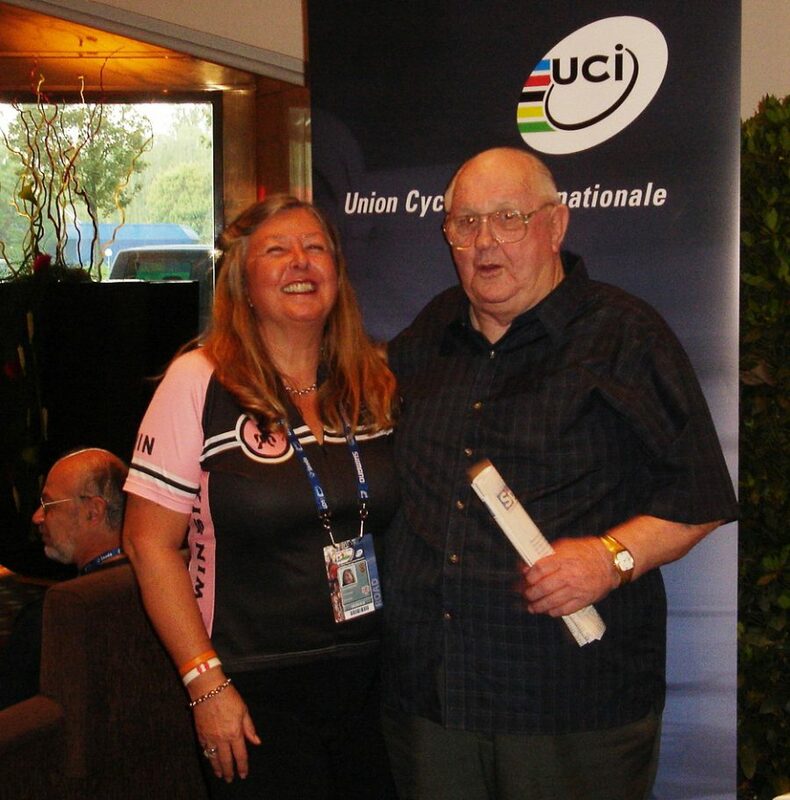 I have worked as a volunteer at the last three Road World Cycling Championships making lots of new friends and much enjoying the experience. I volunteered this year for Mendrisio, offering, as requested, to work once again in Accreditations where my prior experience, multiple languages and knowledge of the cycling world was deemed to be a big advantage. Having applied, I received confirmation of my application and then an email in mid-May advising that I would know my role by the end of July. I’m in regular contact with a number of those that I met last year in Varese, 10km down the road from Mendrisio, and they told me at the end of June that they would once again be working in Accreditations. Prior experience being much sought after. When I still hadn’t heard anything in early August, I sent a gentle and politely worded reminder to one of the organizers. I heard nothing. Meanwhile, one of my German friends Ute, a veteran of volunteering, heard that her services would not be required. Having already booked her vacation, paid for her travel and accommodation, she successfully threw herself on the mercy of the organizing committee, who relented and gave her a job on the Press Centre Welcome Desk. She advised me to do the same. I did, but was advised that the Committee had made an executive decision not to take any volunteers from outside the region. my application! To soften the blow they sent me a pin which would grant me free transport on the regional buses during the Championships. I shall of course still go and, to be honest, am now looking forward to having time to catch up with all the people I know who will be attending and, more importantly, having both the time and the opportunity to ride the course. Of course, this has not dented my enthusiasm for volunteering. Indeed, I have already pre-registered as a volunteer for Melbourne 2010.